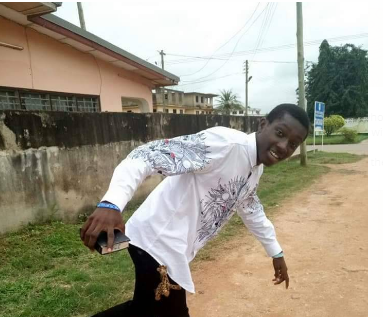 Residents of Shama Junction, Ituma and Nyanikrom and others in the Shama District of the Western Region, are in a state of shock after a 17-year-old final year student of the Ghana Secondary Technical School (GSTS) in Takoradi, was allegedly shot and killed by a police constable. The constable, popularly known in the area as Shaibu, is believed to have shot the student at about 8:30pm on Friday, December 22. Reports indicate that, he opened fire on five students when he came across them on their way to a rap concert at Shama Junction. One of the five students, Caroline Daddie, who narrated the incident to Citi News, stating that the police officer, without any provocation, opened fire on them after he called them them armed robbers. She explained that “I had come to visit my friends to prepare for the dancing competition which was supposed to take place at the school park at 7:30pm. We were five in number so Lawrence, (the deceased) came to join us from Ituma. We then set off because we were already behind the 7:00pm starting time. So when we got to his father’s house, he decided to change his dress, which he did, and even added a headset”. “Just as we got to the point where we were entering the road, I saw the motor rider forcefully getting off his motor. He quickly got down and shouted thieves. The white car also stopped. Just after the shout then there was a gunshot. He fired at Lawrence and Kobina who were ahead of us. Lawrence fell on the ground and Kobina also jumped into the bush with his wounds”. She stated that she couldn’t move after the gunshot, as one of her friends who was fleeing the scene screamed at her to run. “I stood until I saw the shooter get to Lawrence who was already quiet on the ground. I saw him show a sign, which communicated to me that he realized he had made a mistake. Then I heard the person in the car say to him that he is dead so he should leave. He quickly got onto his motor and left. The car then turned around and headed back. I then rushed to Lawrence and held him. I mentioned his name but he could only respond by turning his eyes which were already white and wide open. He was bleeding so much so I did not know what to do, whether to lift him up or leave him and rush to the house. In the midst of that, the other boys also came from the bush and helped to rushed him to the hospital where he was pronounced dead,” she said. A housemaster at GSTS with whom the deceased was living with, said he did not understand why the police constable opened fire on the five young unarmed students. He called on the Ghana Police Service to thoroughly investigate the matter and ensure that the perpetrator is brought before justice. “Lawrence could not under any circumstance be a thief howsoever. He just finished his Elective Maths paper this Thursday. He is a boarder who stays with me personally. The police hierarchy must get to the bottom of this heinous act and punish that constable according to the laws of Ghana,” he said. The father of the deceased, Emmanuel Baidoo, who was in tears told Citi News he had met the constable earlier in the evening and knew him very well. “[How could] Shaibu who I met around 7:30 pm on his motor with his girlfriend in her car, go around my home and commit such a dastardly thing against me? Shaibu is someone I know, and he also knows me and my son as a boarder who schools at GSTS. So what happened within that short period? This is what I demand answers to from the police,” he lamented. Meanwhile, the Shama District Police Commander, Superintendent Innocent Amemo, confirmed the shooting to Citi News, but refused to give any more details. He however stated that the police had commenced investigations into the case.